Redox media, utilizes an all-natural oxidation-reduction process in which an alloy of the "dissimilar" metals copper and zinc is used to create a kinetic charge from the flow of the water through these metals, that kills microorganisms and alters or removes many problem contaminants. It also conditions water with a "softening" effect. In 1987 this exciting breakthrough technology for water purification was discovered. Developed and designed by a leading American scientist, the KDF ("Kinetic Degradation Fluxion") media was awarded both U.S. and international patents. This has been a major advancement in water treatment technology that represents a unique medium for water processing, which by its natural process of electrochemical oxidation/reduction and adsorption action reduces and/or removes many unwanted contaminants from water. Redox has been proven to be the best way to remove major problem substances from our water, and shown to stay active longer than any other purification method. The result is better water than bottled water, at a fraction of the cost. In August, 1992, KDF (redox) was awarded the U.S. E.P.A. 's approval as a "pesticidal device", which means it has the ability to kill algae, bacteria (including Pseudomonas florescens, Ybrio cholera, Legionella pneumophilia, and coliforms), fungus, mold, and many parasites and viruses found in drinking water supplies, through the natural process known as "electrochemical oxidation/reduction". Redox media has also been certified by independent water purification authorities to kill a target bacteria within the "less than 1 minute contact time" required to be effective in point-of-use water filters. Thus it is "bacteriocidal", a much preferred classification to that of "bacteriostatic", a term often used with filters impregnated with silver, which only slightly retards bacterial growth until the silver is exhausted. Redox inhibits bacterial growth throughout the entire unit for as long as it is in service. This media is a major advancement in water treatment technology that works on the electro-chemical and spontaneous-oxidation-reduction principles. Chlorine is instantaneously and almost inexhaustibly oxidized. When redox technology is combined with high-quality granular activated carbon, redox protects the carbon from rapid exhaustion with chlorine by handling the chlorine first, thus allowing the carbon to have a much longer effective life. Redox media with carbon has about 10 times the active life of carbon that is not protected like this. Redox is proven effective against microorganisms, algae, chlorine, hydrogen sulfide and heavy metals (aluminum, arsenic, cadmium, iron, lead, mercury, etc.). Redox and carbon working together also take care of problems with odor, poor taste, THM's, PCB's, dioxin, nitrates and thousands of other organic chemicals and inorganic poisons, for an extended time, . . . at the minimal cost of approximately a few pennies per gallon! Even more effective purification is provided by accompanying the redox and carbon with a sediment filter and/or a solid carbon block or a ceramic cartridge. This filters out particles down to a micron in size, which includes most parasites and bacteria that may be present in water. Most of these that survive the chlorine are killed by the redox, but it is still desirable to remove them if possible. Also, the extra carbon of a solid carbon block extends the effectiveness of the system as a whole in removing organic pesticides and other chemicals. NOTE: A cartridge that contains redox alloy and a special media for thorough removal of fluoride from city water, using a flow-through filtration system, is available for our standard units. For the ultimate in affordable contaminant-removal, corrected reverse osmosis provides the best home water purifier solution: the very high quality purified water you want, . . . conveniently at home, . . . at a low affordable cost, . . . with a minimum of service & maintenance. NOTE: Redox media is a relatively expensive substance. Our water cartridges have the substantial amount of redox alloy needed to do a thorough job. There are other brands, some that look like our units, with the same kind of filter housings, that contain only a small amount of redox media so they may say they have it. These will do a lesser job for a shorter time than ours. Our cartridges are 9 3/4" by 2 7/8", which fit a standard housing if you want superior replacements. Patented Eagle Redox Alloy® is a versatile, specially formulated, bimetal material, consisting of a high purity copper-zinc alloy. This product operates as a multifunctional medium, which has superior capabilities of de-chlorination of drinking water while reducing dissolved heavy metals as well. Redox oxidation/reduction exchanges electrons, bonding with chlorine and other metals contained in the water to create harmless substances. It is effective in removing chlorine, lead, mercury, iron, and hydrogen sulfide from water supplies. Eagle Redox Alloy® is completely safe and meets EPA and FDA standards for levels of zinc and copper in potable water, so the process is not toxic and does not cause any adverse side effects. Eagle Redox alloys are antimicrobial, a substance that kills or inhibits the growth of microorganisms such as bacteria, fungi, algae and mold or protozoans). These antimicrobial properties never deteriorate or deplete. How does Eagle Redox Alloy® Work? -- The Eagle Redox Alloy® redox process works by exchanging electrons with contaminants. This "give and take" of electrons converts many contaminants into harmless components. During this reaction, electrons are transferred between molecules, and new elements are created. Some harmful contaminants are changed into harmless components. Others are electrochemically bound to the Eagle Redox Alloy® media. What Contaminants Does Eagle Redox Alloy® Remove? -- Eagle Redox Alloy® process media works to reduce or remove chlorine, iron, hydrogen sulfide, lead, mercury, calcium carbonate, magnesium, chromium, bacteria, algae, and fungi. The resultant water is conditioned similarly to a water softener, so the water is far better for cleaning, bathing or showering and consumption. Redox media removes up to 98% of water-soluble cations (positively-charged ions) of lead, mercury, copper, nickel, chromium, and other dissolved metals. 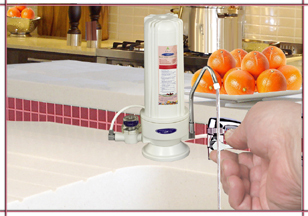 In most cases, more than 98% of chlorine is removed if operated within recommended flow rates. Will Eagle Redox Alloy® remove Iron from the Water? -- Redox media alloys function as catalysts to change soluble ferrous cations (positively-charged ions) into insoluble ferric hydroxide, which can be removed with regular backwashing. With enough oxygen dissolved in the water, iron removal rates of 98 percent or better are common. NOTE: The difference between Eagle Redox 6500 and 9500 is the size of the particles. The 9500 is more effective for iron removal. How Does Eagle Redox Alloy® Remove Chlorine from the Water? -- High-purity copper-zinc redox media consistently remove 99% of free chlorine by electrochemically reducing dissolved chlorine gas to water-soluble chloride ions. How does Eagle Redox Alloy® Remove Hydrogen Sulfide from the Water? -- When hydrogen sulfide contaminated water enters the Eagle Redox Alloy® filter, the copper in the Eagle Redox Alloy® media loses an electron and the sulfur gains an electron and copper sulfide and water are formed. The copper sulfide is insoluble in water and can be backwashed off the Eagle Redox Alloy® filter media. Will the Eagle Redox Alloy® process media remove heavy metals such as lead from the water? -- Eagle Redox Alloy® media remove up to 98% of water-soluble cations (positively-charged ions) of lead, mercury, copper, nickel, chromium, and other dissolved metals. When filtered through Eagle Redox Alloy® media, soluble lead cations are reduced to insoluble lead atoms, which are electroplated onto the surface of the media. Other heavy metals bond to the media and may be recovered when the exhausted media pass through a copper smelter. Will the Eagle Redox Alloy® process media control microorganism growth in the water filters? -- Eagle Redox Alloy® media are antimicrobial. Bacteria growth (fungi, algae and mold) is inhibited by the media, and it reduces lime scale, mold, and fungi throughout the entire unit. The oxidation/reduction potential (ORP) shift by a factor of -300mV or more for water filtered through redox media controls microorganism growth. Treating water reduces bacteria and other microorganisms by disrupting electron transport, causing cellular damage. Eagle Redox Alloy® process media also kill bacteria by direct electrochemical contact and by the flash formation of hydroxyl radicals and hydrogen peroxide, both of which interfere with a microorganism's ability to function. Will the Eagle Redox Alloy® filter systems add any toxic substances to the water? -- Eagle Redox Alloy® process media are completely safe. Eagle Redox Alloy® media meet EPA and Food and Drug Administration standards for levels of zinc and copper in potable water, so the process is not toxic and does not cause any adverse side effects. You may not even realize that Eagle Redox Alloy® process media are working for you. Eagle Redox Alloy® media is the core product of many filtration systems, and can be used in conjunction with other water treatment media to provide superior purification. The difference between Eagle Redox 6500 and 9500 is the size of the particles, the amount of surface area and the capacity. In most cases both grades are used to achieve maximum results. NOTE: Each of these articles about KDF redox media opens in its own window. CLICK HERE for information on redox (KDF) removing chlorine from drinking water and the shower and bath. CLICK HERE for information on redox (KDF) destroying bacteria in water. CLICK HERE for information on redox (KDF) removing heavy metals from water. CLICK HERE for information on redox (KDF) removing hydrogen sulfide from water. 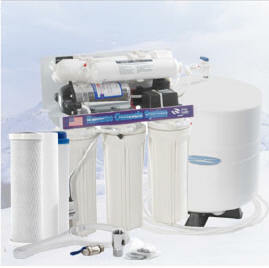 CLICK HERE to review the ISO, NSF and CE certifications for our water purifier systems.